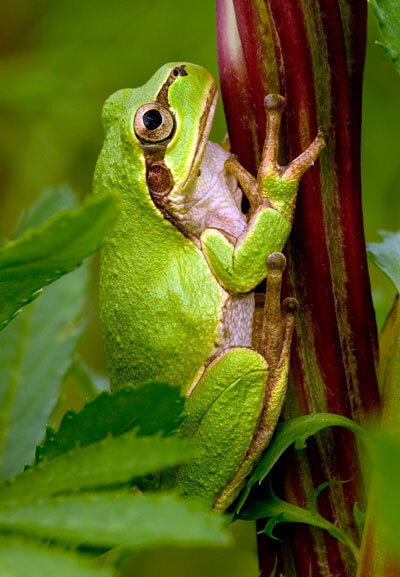 Tree frogs spend the most part of their life in trees, a situation referred to as the arboreal state. Many divisions of a the Neobatrachia contribute to different types of tree frogs, although no close link exists between them. The Neobatrachia is a suborder of the Anura, under the order of frogs and toads This suborder is the most Apomorphic and advanced of the 3 Anuran orders that is alive today. The word “Apomorphic” relates to attributes that are unique to the parent species that the progenies also follow. Tree frogs, with most of their life in trees, are generally found in areas like jungles and forests in the hotter tropical regions all around the world. Depending on the size of these tree frogs, they are divided into four general species. The size difference can range from a few centimeters to 10 centimeters. These frogs are common in Eastern Europe, and can be easily found in shrub lands and meadows. However, in the Western Europe tree frogs are listed among the endangered species. Among the tree frog species, the smallest species are the Common tree frog and they are found in southeast Asia. The disc-fashioned toes on each foot gives a unique look to these tree frogs. These disc shaped toes assist this frog while moving about the trees. They offer great gripping and suction power. All these tree frogs do not always stay on the trees. Those who live in a tree have a disguised disc shaped toe that is supported by a terminal phalanx bone. This extra skeletal support helps them to climb the tree and offer them suction strength. 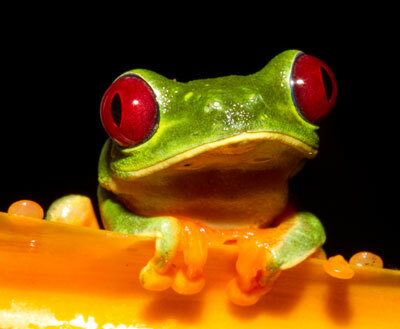 Tree frogs are found in an array of different colors. In the United States, you see them as brown, gray and green tree frogs. Some like the squirrel tree frog some show chameleon like capability to change their color. As their name suggests, tree frogs are basically found around the trees and other vegetation areas. They rarely descend on the land. They come to ground for mating and spawning. However, there are some tree frogs that never come to ground. They build their nests in trees and never leave those trees. Some frogs change their color for improved camouflage. For example a gray tree frog which is also called Hyla Versicolor, they can change their green color to gray and then yellow. The size of tree frog is small and the weight is light. They are usually smaller than frogs that reside on the ground. Their length is about 10 cm. They have well supported disc shaped toes and fingers. This offers a superior capability to hold and clutch. The Chiromantis genus of tree frog has the most powerful grasping ability. They can place their two fingers opposite to each other and build a vise-like grip. These frogs do not make silent pets. They are vocal, especially the male free frogs. So, if you are planning for a silent pet, do not consider them. They are nocturnal thus they are usually get active at night or in the evening. These species are arboreal. Since they live on trees, they have distinguished adaptations such as long legs and toe pads. Their long legs assist them in jumping and climbing. But, all tree frogs do not stay on the trees! Some of these tree frogs reside near the moist ground while others are found near ponds and lakes. These species are present on all continents except Antarctica. They are mostly found in the world’s tropical areas. In the United States you can get over 30 species of these frogs while in Central and South America about 600 exist. Agalychnis callidryas is a species of tree frog. They can be recognized by their bright red eyed eyes. They also have greenish blue and greenish yellow lines on their sides. They have funky orange toes. A bright splash of colors on their body makes them the most beautiful frog species among the tree frogs. They can be found in the Costa Rica’s rain forest in Central America. If you are getting a pet for the first time in your home, then these red eye frogs would not be the right option for you. This is because; these lovely creatures generally sleep during the noon. Their closed eye makes them camouflage. If they are disturbed they abruptly open their red eye. This sometimes gives them some space to leap and escape from the predators. These frogs are agile climbers. They have very powerful suction cup in their toes that assist them to climb trees. The length of the male is usually smaller than that of the female tree frogs. Length of Adult males is about 5 cm while the length of the female tree frog is about 7.5 cm. Male frogs quiver and croak, and at times, they dance and sing also to fascinate the females. They have the ability to change their skin color as per their mood. For mating, the male tree frogs make a loud call to attract the female tree frogs. After mating, the female frogs lay down her eggs on the leaves. The eggs are laid above the water surface. After a couple of days, tadpoles start evolving. The metamorphic process of these tree frogs can either star in a few weeks or it can take some months. For selecting a housing for the tree frog, choose one that is enclosed. Terrariums and aquariums will be the best housing for them. Take a 10 gallon tank for a pair of frogs. The tank ought to be enclosed and screened, which keeps the frog in the tank and at the same time offers proper ventilation. Cover the bottom of the tank with some substrate. 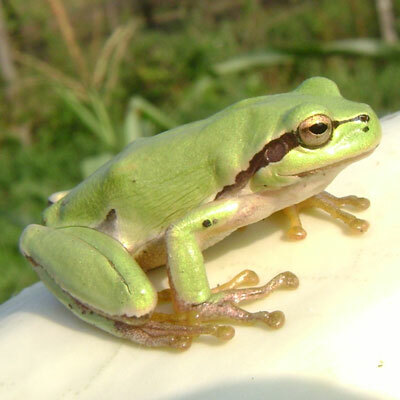 Most suitable substrates for tree frogs can be artificial grass or reptile bark. To maintain your frogs well hydrated, keep a shallow heavy water dish at the base of the tank. Make sure that you fill only dechlorinated water in their water dish. To decorate their tank you can use various foliage, driftwood and branches. Although a real plant should be used, you can also use artificial plants. Since they are easily available and easy to clean and maintain. 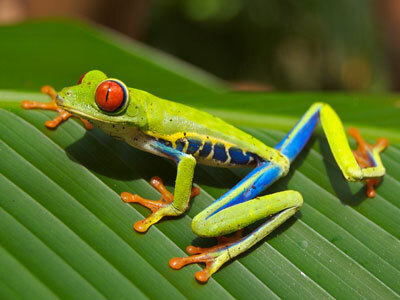 Tree frogs are inhabitants of semi- tropical areas. Hence, the environment should be set hot and humid. To supply external heat you can use a night lamp. Position the night lamp at the outer side of the tank or place them beneath the heater in the tank. The temperature must be set in between 65 degrees and 75 degrees F. To maintain the humidity, mist the aquarium every day. Keep their habitat clean. The tank should be hygienic and cleaned every day. Water in the dish should also be replaced every day. Mature tree frogs mainly rely on insects. They forage for ants, flies, moths, crickets, beetles and many other little invertebrates. Tadpoles start their life as herbivores. They only eat algae. Tree frogs completely depend on small insects that they find easy to swallow. Their diet mainly comprises of meal worms and crickets. These small insects are easily available at all pet stores. If you have crickets in your house, then you can also catch them to serve your pet frogs. The Tree Frog likes to have live insects They do not prefer pre- killed insect food. You can even sprinkle some powdered nutritional supplement on dietary prey to enhance the nutrition in their diet. These powdered supplements are easily accessible from the pet stores. Try to feed your frog every day.